I guessing this deletes the water lines right ? Where does line connect to on the front ? it goes to the back of the water pump. it usually goes to the heater core then to the water pump. there is no heater in your ride is there? Yes I have a heater , but hoses keep leaking so thinking about doing a steel braided line like this but wasn't sure where exactly did this go , in the picture it looks like it goes to the top of the front of the engine doesn't it ? It will be hard to convert those water lines to ss braid/-AN if you're keeping the heater (I assume that's what you want to do since you said your current lines leak). All of the connections are barbed fittings and you'd somehow have to convert them, including the heater core/valve fittings, to -AN. I've also seen the cold start injector time switch location used on the upper water neck/outlet with a 180* fitting so welding isn't required. Probably custom. 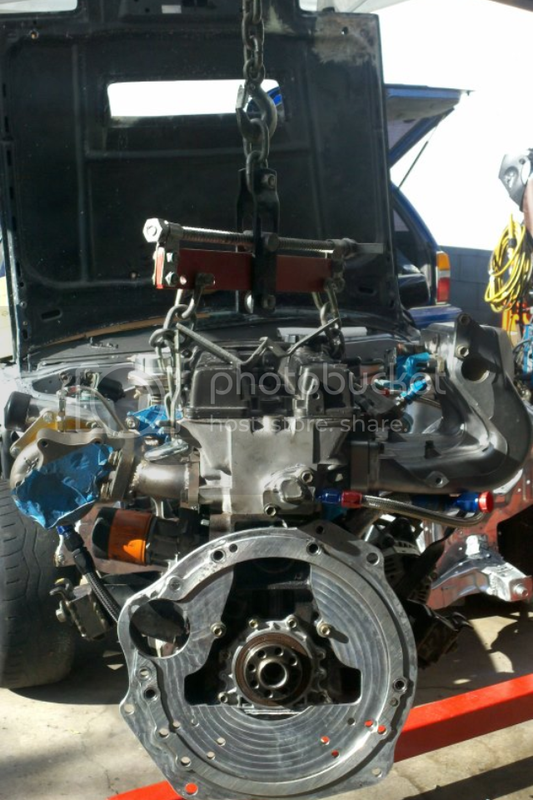 I think sam q (http://s-86.com/index.php) used to sell block of plates for the 16v head and water pump housing, but they don't appear to be on his site anymore. You may try sending an email. ^that lines supposed to go to the backing plate on the water pump for factory flow. seen in pic to left of inlet at thermostat, not the upper water neck. heres factory flow, with no heater, i would say just cap the lines at both ends. its not needed to circulate water, thats what the bypass tube is for, and if theres no BVSV's on the rear, a block off plate should be sufficient on the back of the head and the inlet on the backing plate next to the thremostat. if you follow the flow in the pic below. the outlet on the rear of the head goes to the heater then to the backinig plate, and the ISCV under the throttle body to the same inlet on the backing plate. cap the inlet and outlet and call it a day. save your hard earned $ and put it towards something thats worth it. I think the op was wondering where the coolant line in the original post might be going since it doesn't appear to be following the stock route to the back of the water pump. I wast just trying to help by posting an example of how it might be routed since a lot of 4age race engines run a larger line from the back of the head to the water outlet for better cooling on cylinder 4. It's a worthwhile mod if you've already deleted the heater and the engine is used on track. Thermostat needs the heat and a track car doesn't need a thermostat, that's why its plumbed to the head's outlet. Deuce Cam wrote: It's a worthwhile mod if you've already deleted the heater and the engine is used on track. how so? no extra water is going to flow, the pump can only move so much water per revolution. its going to cool the water in that line, since its not in the engine, but i doubt the effects would be noticable. ^The stock line runs to the water pump and completely bypasses the radiator - probably designed that way to help cycle a steady flow of hot water to the iacv, heater core, and also t-stat (thanks allencr). The custom line has a larger ID and runs to the water outlet. When the t-stat opens this will help evacuate hot water at the rear of the engine into the radiator. It's basically an extra water outlet at the opposite side of the engine, albeit smaller. Probably best on a track car without a t-stat since water would be flowing through the radiator 100% of the time, or a t stat with holes drilled in it. allencr wrote: Thermostat needs the heat and a track car doesn't need a thermostat, that's why its plumbed to the head's outlet. Edit: Will deleting the line at the back of the water pump make a t-stat less efficient? Deuce Cam wrote: Edit: Will deleting the line at the back of the water pump make a t-stat less efficient? my thinking is it will make it more efficient, and keep the motor cooler. IF the bypass line say, cools down the coolant just a bit, and goes right tot he thermostat, then it wont open when the coolant in the block/head is hotter. without the bypass line, the thermostat will rely only on the block/head coolant and open earlier. just the way im thinking about it, someone correct me if im wrong. not really, its coolant from the heater core and ISCV under the throttle body. IF the heater is on, then the coolant is even colder going in. look at the water flow pic i posted, if you route it directly to the pump backing plate, its just not going thru the head the rest of the way. the waer pump can only circulate so much water at a time, so if its only going thru the bypass tube from the upper water neck to the backing plate, OR the upper neck bypass & the rear head bypass, i dont see a difference. maybe im missing something here, but since the water pump can only move so much, i dont see the benefit. does anyone have any documentation showing lower temps? ive read in a few places that the stock 16v 4ag likes to run on the hotter side of things too, if thats true, then bearing clearances and other things should also be taken into affect for a cooler running motor, right? i cant see running no thermostat on a street car as worthwhile, it would be interesting to hear from someone that has ran a 16v with and without this said rear head bypass line, and what their take is on temp differences. too me, its just not adding up. The complete stock layout will keep the engine operating efficiently within the temperature range the oem intended under normal driving conditions. The stock water routing from the back of the head to the water pump has no benefit for cooling on a race engine used in extreme conditions, unless you were maybe running the heater the whole time. Although it doesn't really matter much, deleting the heater/looping the lines (basically running the large ilne from the back of the head directly to the back of the water pump) is actually worse for cooling that running the stock configuration with the heater core/lines in place. This is because a fair amount of hot coolant is now flowing directly from the back of the head to water pump 100% of the time with no in-line heater core valve or heat sink (heater core). Further, water enters the block on the front of the engine, and exits the head at the front of the engine. It's easy to see why the rear of the engine may get hotter. That's where the idea of routing a line from the back of the head to the front water outlet comes in. Theoretically it's a way to help evacuate some of the water from the rear of the engine to the radiator on a car that's deleted the heater. There may not be any data to back the mod up. Imo it seems sound in theory, but in reality the affect may be negligible. I've really only seen the mod on a few 'n2 level' engine builds. Techno Square claims it helps (that's their engine I pictured). On the other hand I've seen a few formula atlantic engines with the rear coolant port on the head blocked off completely. Deuce Cam wrote: Although it doesn't really matter much, deleting the heater/looping the lines (basically running the large ilne from the back of the head directly to the back of the water pump) is actually worse for cooling that running the stock configuration with the heater core/lines in place. This is because a fair amount of hot coolant is now flowing directly from the back of the head to water pump 100% of the time with no in-line heater core valve or heat sink (heater core). Further, water enters the block on the front of the engine, and exits the head at the front of the engine. It's easy to see why the rear of the engine may get hotter. ^exactly what i was thinking. the line from the rear isnt going to the radiator, its going right back into the waterpump and being circulated again. it only goes into the dadiator from the upper neck where the OEM bypass is. the cooled coolant from the radiator is going in to the thermostat inlet, then directly into the water pump. if you want to keep the temps down, just buy a lower temp thermostat. those are $7 compared to the braided lines and connectors. ^That would help. The lower temp thermostat would lower water temps overall, but the oem water flow in/out of the engine remains unchanged; therefore, one could argue that the rear of the engine still may got hotter the front, even if it never got too hot. So say for example your running the stock coolant routing and you never run the Heater , wouldn't you have hot coolant running back to the water pump 100% of the time since thiers no heat exchange happening in the heater core ? Yes. However, I'm pretty sure the large heater lines only flow when the heater is on, i.e. heater core valve open. When the heater core valve is closed water only flows through the smaller sub line (3/8" iirc) that runs to the iac and t's back into the larger heater line right before the water. Correct me if I'm wrong. I'm not really sure how much the heater valve restricts flow. I also think the line off the back of the water pump may not affect t stat efficiency too much since hot water also flows through the t stat housing from the bypass tube that connects to the water outlet/water neck. I'm curious to hear what other people think though. Well, I figured id post my understanding of this. Hopefully it is right ha. If it is not, go ahead and correct anything. - more coolant (cooled from heater) + smaller return line from back of head + coolant from TB flows into back of water pump. When the heater is on or off, the coolant flows through the block and head again and then out of the upper waterneck. Assuming the coolant to/from the TB is deleted, then coolant only flows from the thermostat housing through the block and then through the head. The coolant that flows to the back of the head has to find its way out through the front of the head. This would lead to higher coolant temperatures. Coolant flows from the radiator into the thermostat housing. Then the coolant flows through the block and into the head. The coolant from both sides of the head can escape into the upperwaterneck and into the radiator. Therefore, the coolant is not lingering in the back of the head. With the coolant tube size fixed throughout where the coolant flows, the amount of coolant pumped is dependent on the rpm. The size of the tubes that the coolant is flowing through decides the psi of the coolant depending on the rpm. 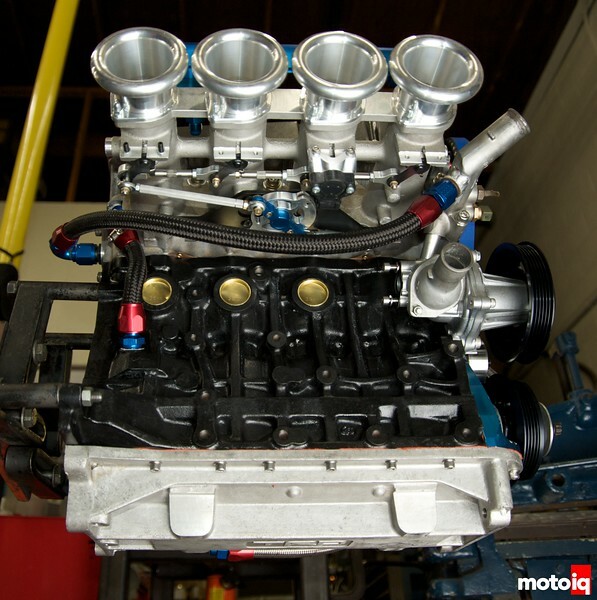 As rpm increases, the speed of the waterpump increases, so more coolant is pumped through the engine. The opposite is also true. So in my opinion the tech arts style of routing a line from the back of the head to the upper water neck seems to be the best way to go. Always run a the rear coolant piping in stock formation with heater or without heater. The rear cyc. 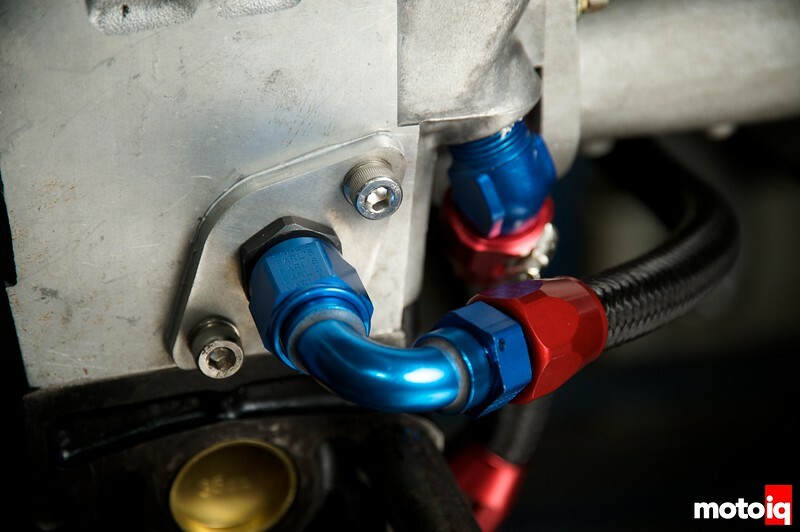 #4 will get too hot and will over heat speacially for track use and if you lower temps with a lower thermostat having piping to the back of the wayerpump will allow the t-stat to fully open faster. Rather than being half way open and track use rear of the head will over heat..
Imo having ss line going to back of waterpump and to the front water neck will be best again imo!! to get maximum cooling for track or sprited driving! !